Bring you coffee cup and favorite magazine and spend some quiet time Rocking on Yvonne from StoneGable’s front porch! 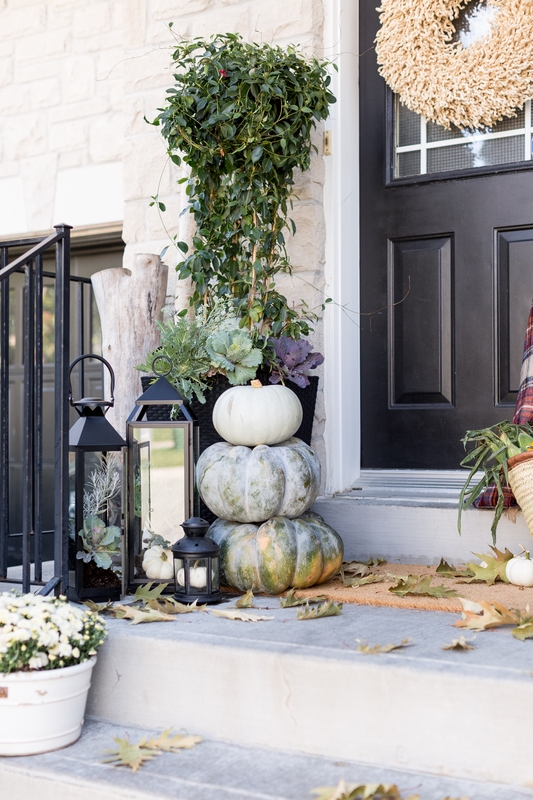 When you drop by to visit Kim over at Sand And Sisal you will know that Fall is a Wonderland Season filled with Pumpkins…Mums and Apple Cider! Be inspired! 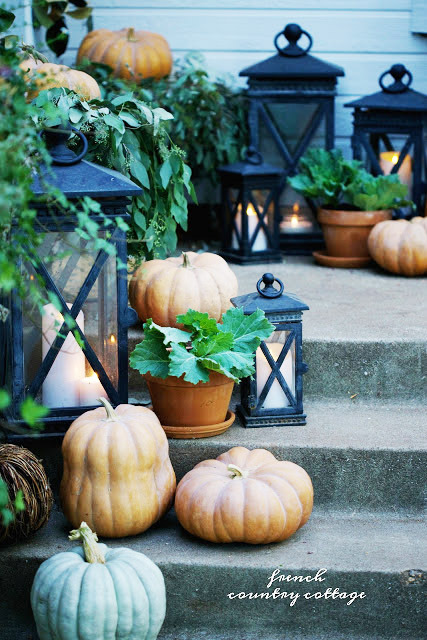 When you visit the French Country Cottage you will be in for a magical Fall Evening as the gorgeous Milk Pumpkins…Greenery and Lovely Lanterns greet you with a sweet glow. When you sit on Susan’s Fall Porch over at Worthing Court you will be transported to a place with a cool breeze…hot drink and everything Nature has to offer. Enjoy your stay. 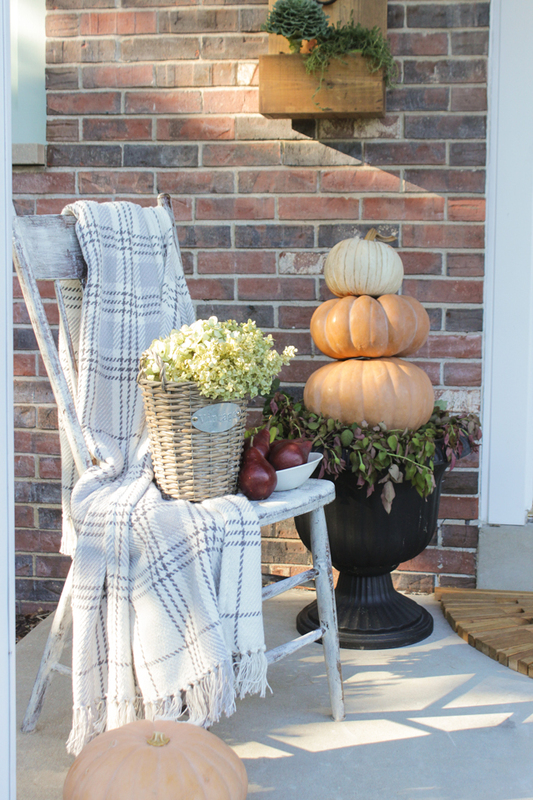 Shayna over at The Wood Grain Cottage has a DIY that will make your Fall Porch a bit more special. 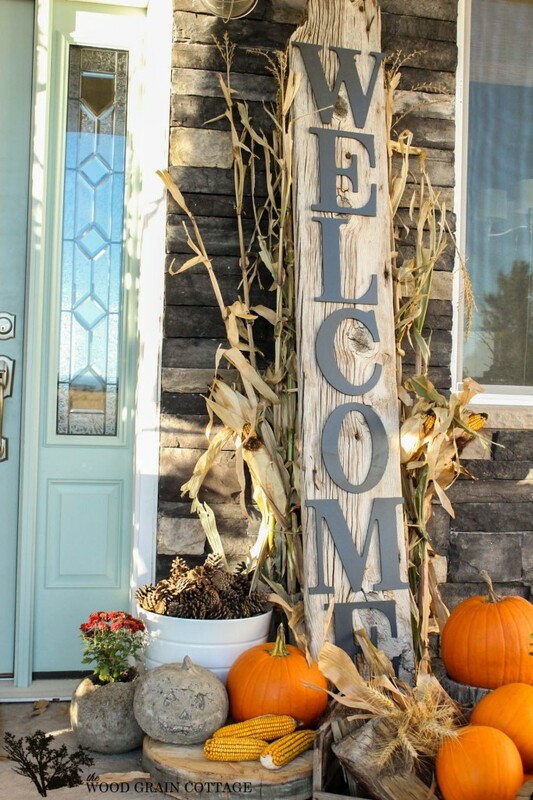 Drop by for the great tutorial for this Huge Front Porch Welcome sign…you are going to love it. 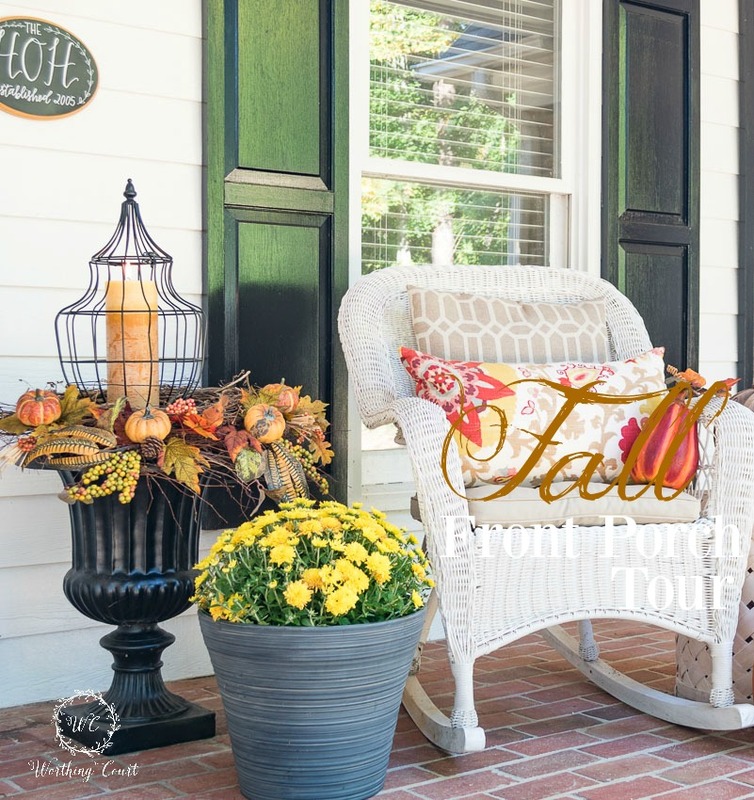 We are back visiting Shayna over at The Wood Grain Cottage once more but this time she is sharing her Front Porch in all it’s Cornstalk Glory! 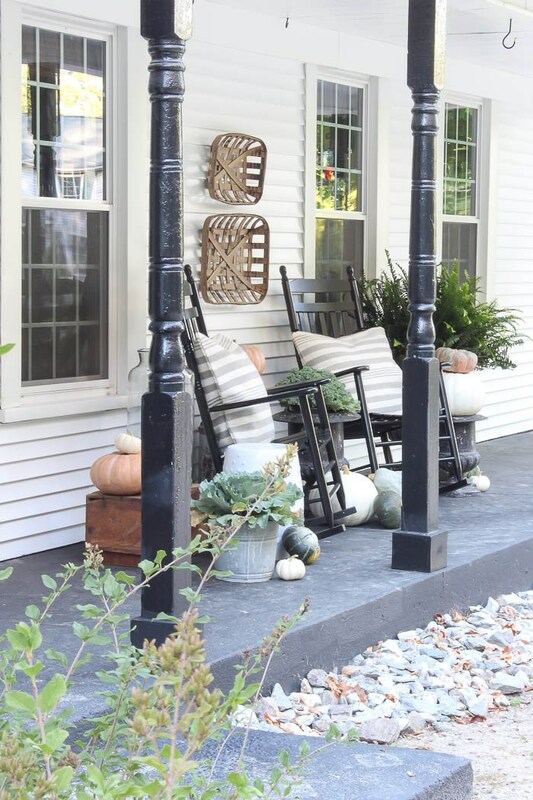 Now it is time to hop on over to Liz Marie’s Front Porch…I love the simplicity of it…all you need is a Chippy Pew or Bench and a few fun Fall accessories! 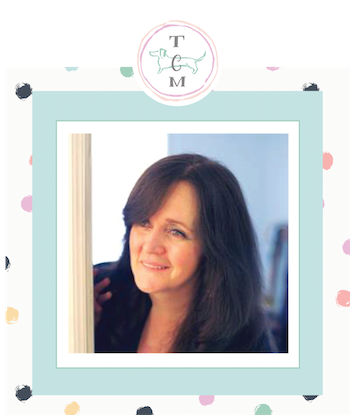 Come on over and see the whole space…I have a feeling that you will be inspired. 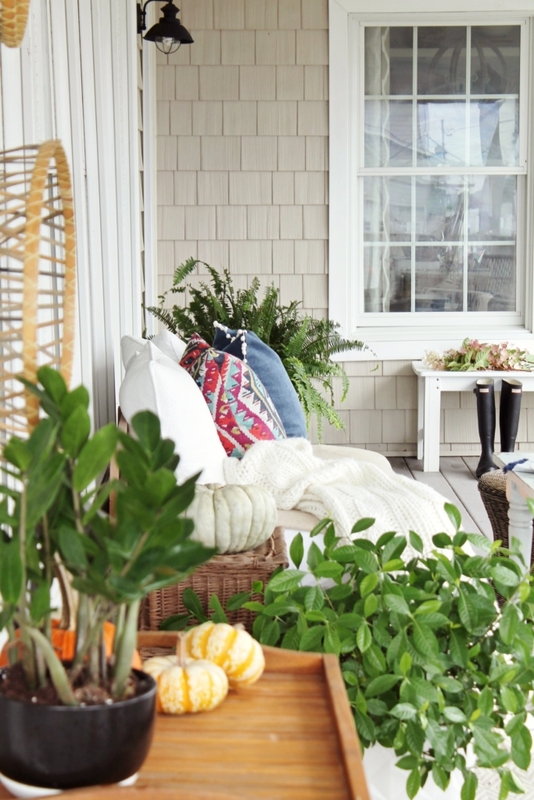 Time to sit a spell and cozy up on this warm and inviting Porch over at City Farmhouse. I hear that they are serving Hot Chocolate…so don’t be late! 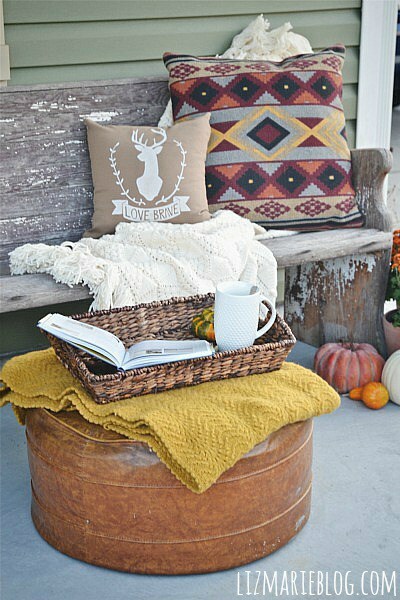 I am kind of Crushing on this Falltastic Porch over at Ella Claire Inspired. 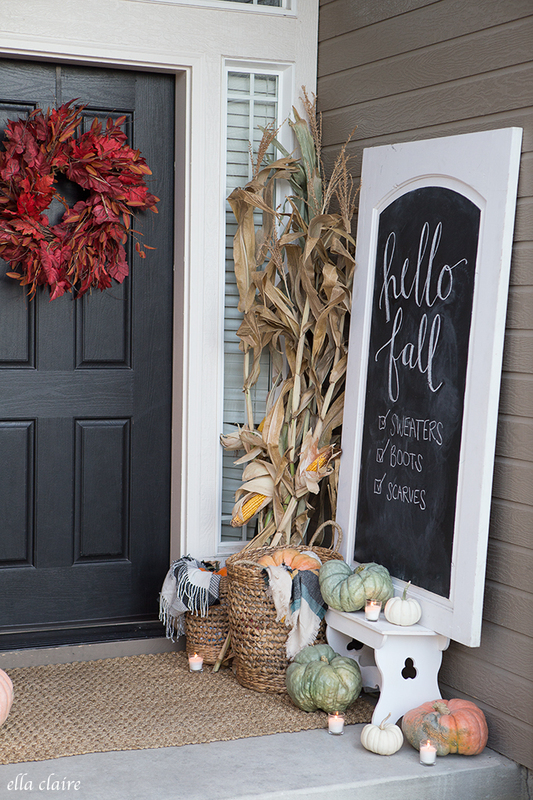 I am love with that Farmhouse Chalkboard welcoming FALL! 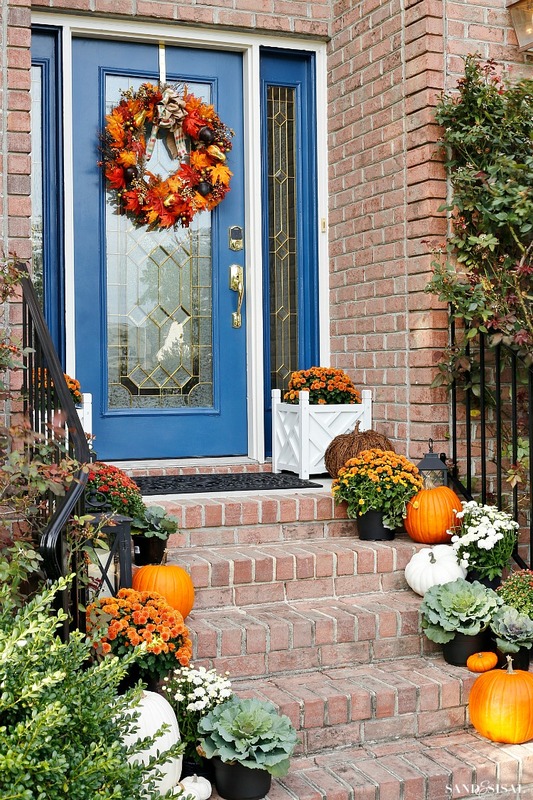 See how she put the entire space together with just a few Seasonal items! 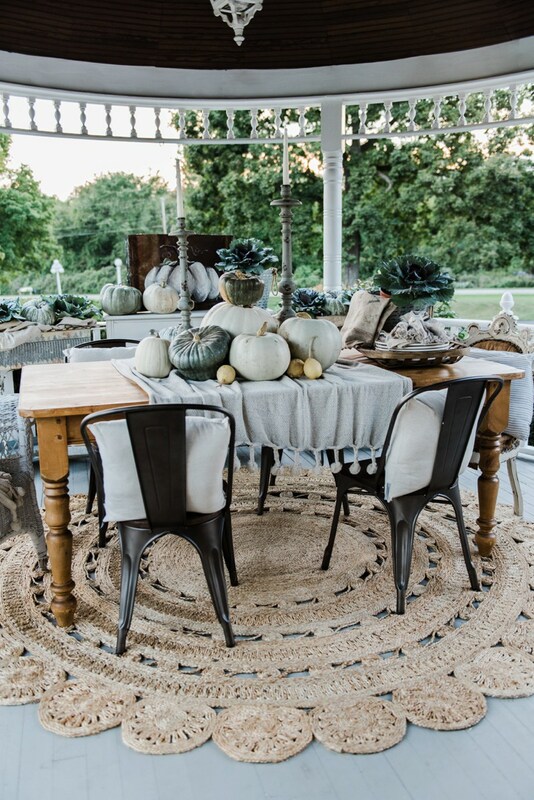 Some vintage Tobacco Baskets…Striped Pillows…Gourds in all shapes and size…amazing greenery and Rockin Rocking Chairs are sitting together on Bre’s front porch over at Rooms For Rent. They work together in perfect Farmhouse Harmony. There is a Happy Haunting Halloween Fall Porch waiting to greet you over at Twelve On Main! 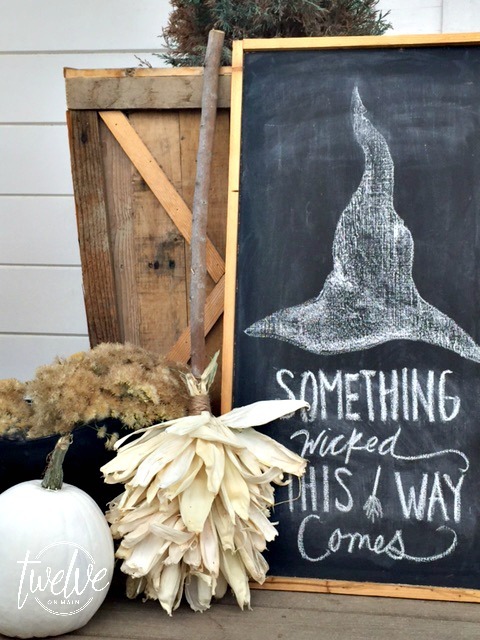 Once again a Giant Chalkboard enters the design and it is bewitching!!! You need to see all the details here…so grab a cuppa and enjoy! This is just a little peek into the wonderful world of Miss Mustard Seed’s back deck. Incredible Vintage Furniture…Gorgeous Gourds…Farmtastic Baskets and so much more awaits you along with an adorable Furry Friend and tons of Inspiration! Lucy from Craftberry Bush has such an incredible imagination that always leads to wonderful creations. I highly recommend you add some of Liz’s stacked pumpkins in various sizes and shades. Once you start with that…the rest is a bonus! Do you know what is even better than a 3 stack of Pumpkins? A 3 Stack Pumpkin Topiary…that’s what! 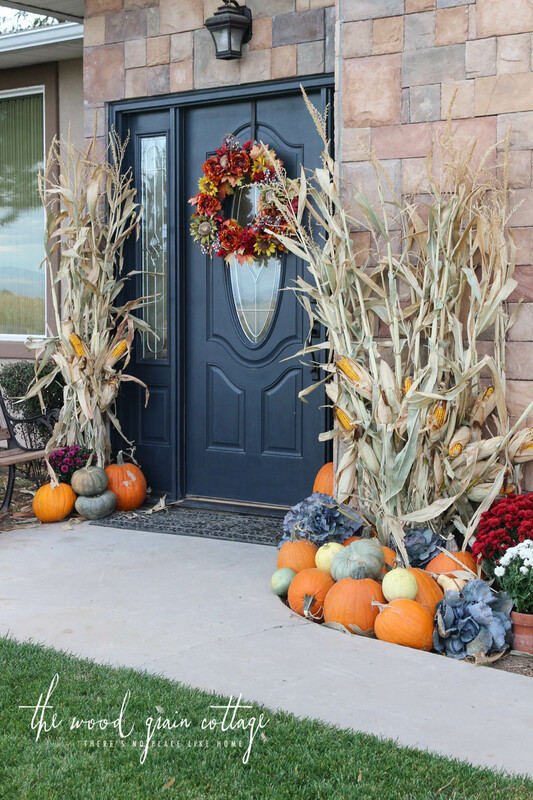 Two of those beauties on either side of your door is the best beginning of a Farmtastic Porch! Check it out over at Shades of Blue Interiors. 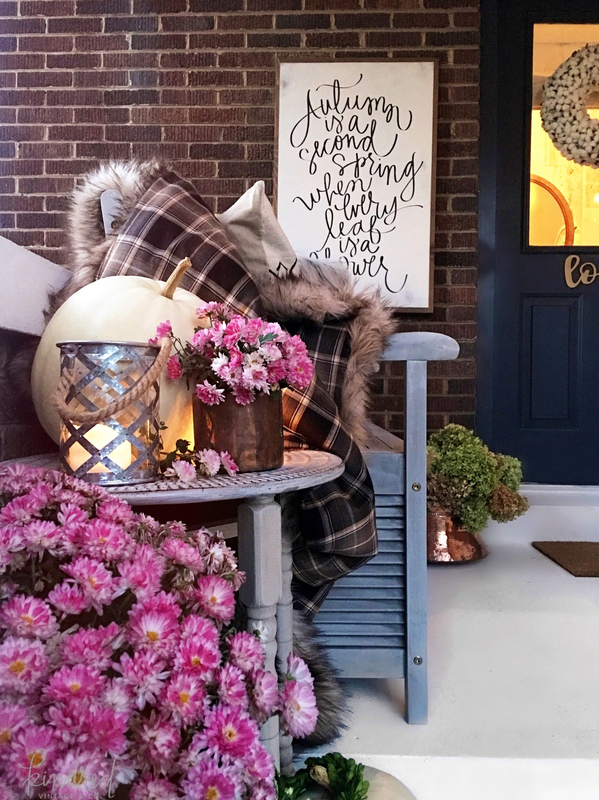 A simple Farmhouse Wooden Couch…a table…a touch of FAUX fur…copper…flannel…pillows…mums and lanterning you can turn you porch into the place to sit! 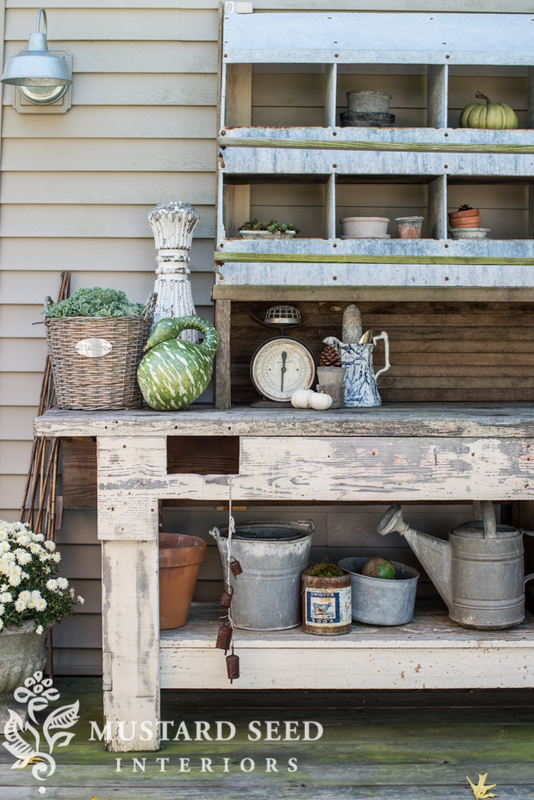 There are tons more to see over at Kindred Vintage Co.
KariAnne over at Thistlewood Farms has an “Almost Close To Amazing” Porch!!! 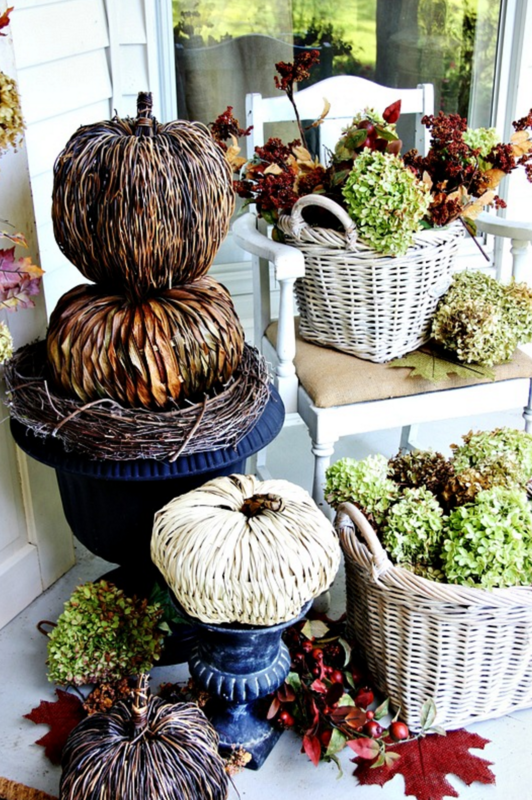 Rattan Pumpkins…baskets filled with Gorgeous Hydrangea and a Rocking Chair’s Perfection. 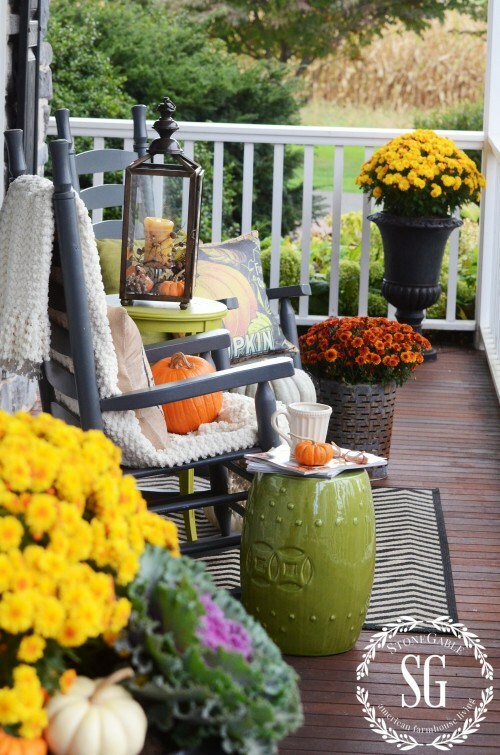 I just love fall and your posting of Fall porches gives me a lot of inspiration to created a special Fall porch for my self. The pumpkins and chalkboard writings give them a special touch. What I really love the most are the lanterns with the pumpkins. I think they make a wonderful combination. So right now I’m torn to what I should use to create mine with so many wonderful ideas! Thanks so much for this posting! Hi there Regina! How are you! 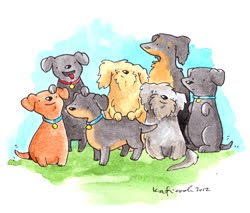 I am so thrilled that the post inspired you so much…YAY…I LOVE IT!!! I have to tell you for some reason my favorite is the Chalkboard…I don’t know why but I LOVE IT!!! The lanterns are gorgeous also! I am sure you will come up with something FALLTASTIC. If you want to use tons of lanterns…they are only $3.99 at IKEA and they are white so you can use them with anything but if you wanted them a different color…just hit them with spray paint in your favorite color : ) Let me know what you decide…I am excited for you : ) Have a great time creating!!! Sending hugs and wishes for a picture perfect day!